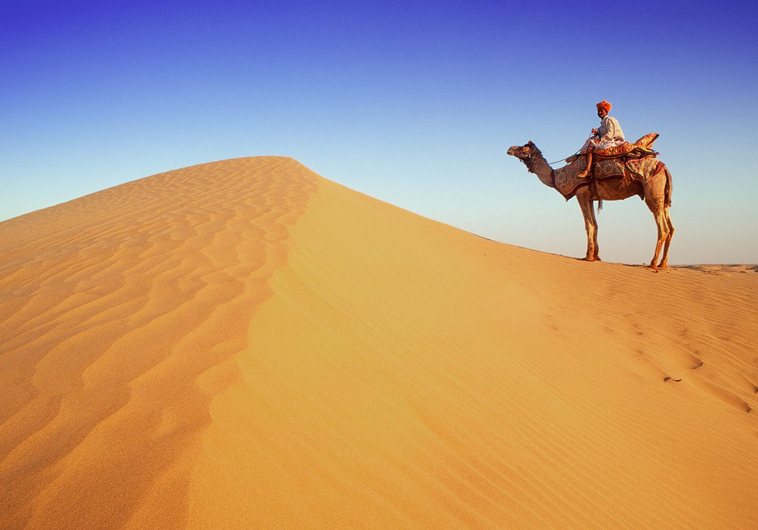 Rajasthan Desert Tour – This tour will introduce you to Delhi, the capital of India, and Rajasthan, the state of full of history. This state is set with its magical land set amidst the desolate desert beauty teeming with colour, joy and friendliness. Enjoy an overnight Camel Safari and stay in tent camps. Also see miniature paintings and frescoes, forts and palaces, for which Rajasthan is famous worldwide and at the end of the tour, you will be visiting the World famous love memorial Taj Mahal – one among the seven wonders of the world. Our representative will pick you up on arrival at international airport at Delhi and transfer to hotel. Rest and overnight stay at hotel. After breakfast, sightseeing of Jamia Mosque, Red Fort, Ghandi Samadi and a walk through the small lanes of Chandni Chowk with a government approved English speaking guide. Lunch at Connaught Place. After lunch, sightseeing of New Delhi – Laxmi Narayan Temple, Presidents House, Embassy area, India Gate, Humayun Tomb, Bhai Temple (lotus Temple) and Qutab Minar. Shopping, light sound show in the evening. Overnight stay at hotel. Breakfast at hotel, drive to Mandawa visiting Junjunu on the way. Check in at hotel on arrival. Afternoon sightseeing of the town – Chokhani and Ladia Havelis and the street of Saraf Havelis, Shiva Temple, Dundlod Fort, Nawalgrah and the main marketplace. Dinner and overnight stay at hotel. Drive to Bikaner after breakfast. On arrival check in at hotel. Lunch at hotel. Visit to Lalgarh Palace, Junagarh Fort (1593 AD), Suraj Pol or sun gate, Ganga Golden Jubilee Museum, Gardens and parks, Bhandsar Jain Temple and Camel Research Farm. Dinner and overnight stay at hotel in Bikaner. Breakfast at hotel, drive to Pokhran Fort. Check in at hotel on arrival. Rest of the day is for leisure is for leisure. Dinner and overnight at hotel in Jaisalmer. After breakfast, sightseeing of Jaisalmer – the Golden City of Rajasthan. Visit to Fort, Manak Chowk and Havelies, Gadisar Lake, Tazia Tower, Havelis Nathmalji-Ki-Haveli, Patwan – Ki Haveli, Salim Singh-Ki-Haveli, Jain Temples, Gyan Bhandar or Library. Evening is free or trip to Sam Sand Dunes. Overnight stray at hotel. Leave for the camel safari. Overnight stay at tent camp. Drive to Jodhpur, visiting Mandore on the way. Check in at hotel on arrival in Jodhpur. Visit Mehrangarh Fort, Jaswant Thada and Umaid Bhawan Palace in the afternoon. Morning drive to Udaipur en-route visit Rohetgarh, on arrival in Udaipur check in at Hotel, evening at Leisure. Stay overnight at Hotel. Boat ride at Lake Pichola in the morning. Then visit City Palace, Jagdish Temple, Museum, Saheliyon ki Bari, Pratap Memorial, Fateh Sagar Lake, Pichola Lake, Sajan Grah, Gulab Bagh (Gardens of the maids of Honor) etc. Overnight stay at hotel in Udaipur. Drive to Pushkar after breakfast visiting Elkingi, Nagda and Nathdawara, and Ranakpur Jain temples on the way. Check in at hotel on arrival in Pushkar. Overnight stay at hotel. See Temples, Ghats, afternoon visit to Ajmer (Tomb of a Sufi saint) in the morning. Then drive to Jaipur. Check in at hotel on arrival in Jaipur. Stay overnight at hotel in Jaipur. Jaipur sightseeing – Amer Fort, Jai Mandir (Hall of Victory) and Fort of Jaigarh. Drive back to Jaipur visiting Handicrafts factory housing Rajasthani handicrafts, gemstones and antiques for which Jaipur is famous worldwide. Lunch at any restaurant; continue city sightseeing – City Palace, Jantar Mantar, Hawa Mahal, Rajminder Theater. Evening shopping. Dinner at hotel / restaurant. Overnight stay at hotel in Jaipur. Breakfast at hotel, drive to Agra, (if interested, may take a stop at world famous Bharatpur Bird sanctuary on the way). Drive continues to Agra visiting Fatehpur Sikri on the way. Check in at hotel on arrival. Visit Taj Mahal. Dinner at hotel / restaurant. Stay overnight at the hotel. Visit Taj Mahal at sunrise (optional). Breakfast at hotel and checkout to visit Agra Fort and the city. Then drive towards Delhi, visiting Mathura (Lord Krishna’s Birth temple) on the way. On arrival at Delhi, transfer to airport / railway station for onward destination.